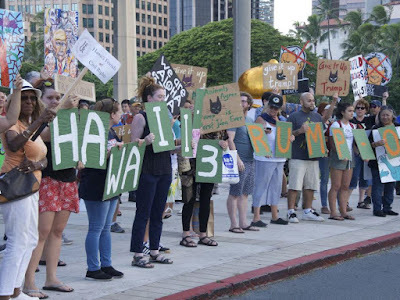 Protesters in Hawaii mocked Donald Trump with signs that said "welcome to Kenya" as the President touched down on the first leg of his Asia-Pacific tour. Making light of the President's past enthusiasm for the so-called "birtherism" conspiracy that targeted Barack Obama, who was born in Hawaii, demonstrators also held signs that read "Aloha means goodbye" and "Immigration gave me my family". State congressman Kaniela Ing told Hawaii News Now: "Hawaii is the most diverse state in the nation, and just a few days ago Trump literally said, ‘Diversity sounds like a good thing, but it is not a good thing.’ That statement alone undermines the values that make Hawaii, Hawaii." Islanders called their rally "Hawaii 3, Trump 0", referencing the number of times courts in the state have blocked the President's attempts to institute a ban on travel from majority-Muslim countries. Mr Trump was in Hawaii on Friday for a briefing by US Pacific Command military leaders on North Korea and other issues, ahead of his trip to a string of Asian nations over the next week or so. He also visited Pearl Harbour and the USS Arizona memorial to the people killed in Japan's attack on the base in 1941. At the end of October the US moved a third aircraft carrier strike group into the western Pacific in what was seen by analysts as a show of strength aimed at both North Korea and China. Mr Trump has traded rhetorical blows with North Korean leader Kim Jong-un for months over Pyongyang's nuclear ambitions and provocative missile launches. He is likely to use the regional tour to shore up key alliances with Japan and South Korea, and to prevail on Chinese premier Xi Jinping to exert more pressure on North Korea.